26 officer-involved homicides. Nineteen people were fatally shot by law enforcement and seven fatally shot themselves during the incident. Select the year to link to the OHA graph for that year. * Type of firearm used was not recorded for all deaths. In Oregon, at least one person every day takes his life by shooting himself to death. When most people think of gun violence, they think of homicides or unintentional shootings. The reality, however, is that most shooting deaths in Oregon are suicides. In fact, about one person a day commits suicide with a gun in Oregon. Firearm owners are not more suicidal than non-firearm owners; rather, their suicide attempts are more likely to be fatal. If highly lethal means are made less available to impulsive attempters and they substitute less lethal means, or temporarily postpone their attempt, their survival odds greatly increase. Studies in a variety of countries have indicated that when access to a highly lethal and leading suicide method is reduced, the overall suicide rate drops driven by a drop in the restricted method. The suicide rate among Oregon veterans 18-24 years of age was 85.9 per 100,000 in 2013— almost ten times higher than the state average rate for the same age group of non-veterans. Firearms were involved in most suicides (52%), followed by hanging (34%). Are you a teacher? Learn the signs of suicide and what you can do to prevent a tragedy. Read the Oregon Health Authority’s informational page “What Every Teacher Should Know” or download the brochure. 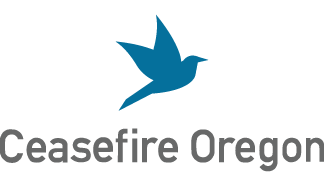 The Ceasefire Oregon Education Foundation partners with Lines for Life and the Oregon Youth Suicide Prevention Program.